Elvis never made it to Hungary, neither to Europe, but Elvis spirit will be in the building on the night at 8 p.m. Wednesday, June, 6. 2018 in the Budapest Sport Arena. This night Elvis returning to the stage with Priscilla Presley in Budapest. How about you being present to fill the vibes at the awesome concert. Even though we are in the middle of the wintertime and Elvis’s „arrival” will be in the midsummer. Here is an Early Update for those Elvis fans who live in Hungary and/or planing a visit, staying in Budapest during the superb Elvis show to have your seat reserved before they are sold out! Tickets are already out, so mind you have to purchase ASAP. 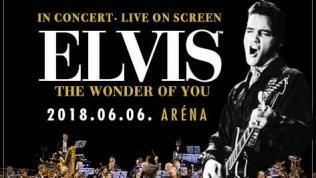 This will be a one night „live” concert, experiencing Elvis „The Wonder of You”, featuring the most recognizable voice of all time with a full symphony orchestra live on stage performing the King of Rock ’n Roll most well-known songs and his tender, heart-wrenching ballads. Songs in the framework of a special concert, come to life in their original form. The concert is highlighted with the presence , the personal appearance by Priscilla Presley. Elvis beloved music fans in Budapest will have an opportunity that many have never had before to experience the man who changed the course of popular music. He was the biggest selling solo artist in history … having sold an astonishing one billion records worldwide. As part of the show, the audience can enjoy the original video and sound recordings of Elvis, the great voice and the greatest hits of the king, featuring at a huge projector – gospel, country, ballad – with a full symphony orchestra. Most probably his soul will be int he air at the Budapest Sport Area. After all these years it’s wonderful to know that The King is still loved and remembered all around the world…..This will be a show not to be missed.